In high school, I learned all I could about calories and how eating better could help me lose weight. I put this knowledge into practice and finally dropped some pounds. I decided to learn as much as possible about nutrition so I could find my own my way to manage my weight. That’s why I became a nutrition specialist. Learning to control my cravings naturally has helped me overcome my fears of gaining weight again. But paying attention only to the numbers on the scale is not enough, and only when you are in control of your weight you can say you made it. In this article, I’d like to share the knowledge I’ve gained over the years and show you how you can stop food cravings naturally. Have you ever felt an unstoppable food craving that was stronger than you? You knew you shouldn’t go for it, but you couldn’t resist. This lack of control is very annoying, isn’t it? As with many other things in life, weight management related issues are much better approached when you understand what’s going on in your body, why, and the actions you need to take. In this post, I will explain the causes of those uncontrollable food cravings and the biological processes behind them, and I will give you easy to apply recommendations on how you can stop food cravings naturally. Just imagine how it feels to be in control of your food cravings and what it would mean for your weight! This is not a scientific paper on food cravings that aims to cover every single aspect of the topic, but an effort to explain the main reasons for food cravings and how to practically deal with them, in understandable terms without going too deep into science. The goal of this post is to give you enough information to understand the “whys” behind the food cravings and enough practical means for you to be able to stop food cravings naturally. Although food cravings can be caused by hormone imbalance or nutritional deficiencies, I would like to declare those food cravings off topic here. The way to deal with such food cravings is pretty straightforward: Either accept them and let them pass (pregnancy or PMS cravings, for example), or see a doctor if you suspect a nutrition deficiency. Instead, I’d like to focus this post on the unhealthy food cravings that you deal with every day. If you’re craving celery sticks, go for it! But if it’s donuts, chocolate, cheeseburgers, and similar foods that you can’t keep your hands away from, it’s dangerous for your health in the long run and you have to stop them. So what triggers these unhealthy food cravings that make you feel so powerless? Many authors cover the emotional part of food cravings, not considering food engineering and biology, but I’m sure you’ve noticed that you can crave food even without emotions involved. In this post, I’d like to fill this gap and put the spotlight on food engineering and sugar imbalance as triggers of food cravings. Let’s look at each trigger in detail. You see an apple pie and instantly think about a pie your mom used to make. Your mom lives far away, but that pie is right there. You feel lonely, but there is no one around. There is, however, chocolate ice cream in the fridge. Your boss is being unrealistic, and there’s nothing you can do about it. So you jump into a bag of chips, as you do every time you feel stressed. Many feelings are hard to deal with, and food is an easy way to help you handle them… and there is a physiological explanation for it. There are areas in your brain responsible for memory and sensing pleasure, which also act as reward centers. Specific foods can send signals that reach those brain centers and “make you feel good,” which will of course help you deal with those emotional needs, like calming you down and reducing your desire and anxiety, at that particular moment. The way it works is that the brain recognizes those feelings and knows that certain food can help alleviate them, so the body produces appropriate hormones (for example, cortisol) and other biochemical substances, like the neurotransmitter serotonin to make you crave for the “right” food. You can read more about biochemistry of food and food cravings here. Trigger #2: High-processed food as a product of food engineering. Have you noticed how you go for groceries to pick up “just bread and milk,” but once you’re in the store, you suddenly start craving all this food from the colorful packages aligned so nicely on the shelves? This would be fine if all this high-processed food was healthy for you. Except it’s not. It is delicious, though, and this is exactly the problem. The food manufacturing industry makes a conscientious effort to get people hooked on foods that are inexpensive, but yet tasty. They hire food engineers and gather tons of data taking an engineering approach to processed food. Although food engineering has been there for many years, the power it has over the consumers has not really been acknowledged until the most recent research and work of Michael Moss, the author of the best article on this topic you’ll ever read: The Extraordinary Science of Addictive Junk Food. Food engineering is manipulating your taste buds. Food engineers work hard on the food’s taste, which is measured by how much craving this particular food will induce. With that idea in mind, manufacturers have been adding sugar to many products that didn’t really need it, like tomato sauce, bread, and crackers. They look for the exact amount of sugar that will make the product highly attractive and desirable without making you feel overwhelmed by the intense flavor (they call it “the bliss point”). Not only will you crave that product again, but you’ll expect it to taste sweet. As a consequence, your taste preferences will change to prefer food that contains more sugar, and you won’t be satisfied with something that has less sugar. Food engineering is also turning you into an addict. You may be thinking I’m exaggerating, but numerous studies (like this one and this one, for example) indicate that sugar has similar effect on our brain as the drugs of abuse. This is why it is so hard to get off sugar and carbs once you are hooked. You can experience food cravings even if you don’t get emotional or eat high-processed food. Let’s first look at how your body processes sugar and carbs. The first organ that your biology needs to take care of is your brain. If your brain doesn’t work properly, nothing else will. The only source of energy that your brain can use is glucose. When your brain can’t find glucose available immediately, it will find a way to get it. The fastest, easiest, and most effective way your body can get glucose is by releasing the right hormones to make you crave food that contains a lot of it: simple sugars and carbs that break easily into glucose. But high sugar levels in your bloodstream are toxic, so your body needs to lower those levels. For this, it makes the pancreas release insulin to remove glucose. This process is called sugar metabolism. The higher the glucose levels, the more insulin is released and the faster all the glucose will be processed, leaving no glucose in the system again, which will start the cycle from the beginning. As you can see, your sugar metabolism needs equilibrium for you not to get trapped in the vicious cycle of food cravings. In this case, eating sugar and carbs “the right way” means making sure the quantity, frequency, combination, and quality of your meals are appropriate. Quantity: How much sugar and carbs are in your meals? When you consume large quantities of simple sugars (glucose) or carbs (more or less complex forms of sugars that are transformed into simple sugars) in the same meal, your sugar metabolism will be activated in the emergency mode, removing all glucose suddenly. As a result, no glucose will be left in your bloodstream, and your brain will activate the mechanism to release the hormones that will make you feel hungry and eat more so it gets glucose again. Say hi to another food craving! Frequency: How often are you consuming sugar and carbs? When you are constantly eating food rich on sugars or carbs, not letting enough time pass between meals to let your sugar metabolism rest, it will end up constantly working, creating a circle of constant eating and hunger. When you wait enough time between meals (three to four hours), assuming you had a balanced meal, the sugar metabolism gets to rest and does its work properly. Combination: What are you mixing your sugar or carbs with? When you eat sugars or carbs alone, with no fiber, protein, or fat, the absorption of glucose will be faster. You’ll feel hungry sooner, and as a consequence your brain will trigger a food craving. Quality: How “good” are the sugars and carbs you’re eating? Simple carbs (like white rice, pasta, and bread, for example) and sugars break down into glucose faster, causing it to be absorbed faster as well. When you eat complex carbs (like brown rice, whole grain pasta, and whole grain bread, for example), however, glucose is released gradually. It means that in case of simple carbs, your blood sugar level will rise faster than if you eat complex carbs. To understand how fast a specific food will break into glucose and how much carbs it contains, you should look at its glycemic index (GI) and glycemic load (GL) values. Eating high GI & GL carbs will generate a fast rise in sugar and therefore a faster metabolic response, which will give you another food craving. In the beginning of this post I promised you that I’d show you how to stop food cravings naturally by fighting the cause and not the symptoms. Now, when you know what triggers food cravings and what keeps them reoccurring (i.e. you understand the cause), it becomes clear that to beat those food cravings, you need to fight the triggers—deal with your emotions and resist the temptation of food manufacturing industry on one side, and keep the equilibrium of your sugar metabolism on the other side. Let’s look at it step-by-step and identify the practical solutions for each trigger. If you think about it, that pie, ice cream, chips, or anything else you’re craving won’t change the way you feel about things in the long run. The food that you crave is the specific one that will make you feel better immediately. But the moment you finish your food, those “feel better” compounds will disappear again and you’ll be exactly where you were before, and you’ll probably even having the same cravings again. You need to realize that satisfying those food cravings helps only for a short period of time, and that this vicious cycle needs to be broken. Recognizing that food, even the most delicious one, does not change anything is the first step. Think about what brings up those emotions in you. Learn about yourself so you can predict them. Do your job and fight against them instead of just reaching for a piece of cake. Don’t give up by thinking there is nothing you can do. There are many hormones that you can’t really control, like your hormones during pregnancy. But many others are released as a consequence of your emotions. Once you acknowledge that you can do something about it, you’ll be able to handle them much better. Find other ways to reduce stress. For example, get a relaxing massage instead of hating your boyfriend, boss, and waistline, instead of eating ice cream. Practice relaxation techniques, like yoga or deep breathing. Look for ways to manage your emotions (talk to a friend, get a pet, go for a walk or to the movie theater). Eat healthy. It will help you maintain your hormones under control. Call your mom or visit her if you miss her instead of eating her pie. The food industry has many tricks to manipulate you into eating food that you’ll end up crave more and more. Food manufacturing companies are powerful, they hire the best food experts in the field, and they are always one step ahead predicting new trends and developing new ways to hook you on their food. But you need to be smarter! Learn their game. Don’t let them decide what and how you eat. Be the one in charge of what food you like by changing your buds’ taste and start craving for healthy food instead. Read the labels and learn how to identify sugars in tricky and unrecognizable names used in food labels. Most probably food engineering has got to your food buds already, so now you need to change your taste preferences back to healthy food. Do it slowly, one change at a time. Otherwise it will be harder to succeed. Cook your own meals, which is the best way to know for sure what your meal consists of exactly. You’ll be able to avoid most of the added sugar and many other undesirable ingredients you will usually find in highly processed food. Find out where the sugar, fat, and salt bombs you are more susceptible to are hiding so you can avoid them. Here are a couple of popular examples: potato chips, crackers, Japanese snacks, sesame sticks, etc. Recognize that the attractive packages can make you desire unhealthy food. Understand that the commercials are there just to trick you into thinking that eating certain foods will improve how you feel about yourself. How food engineers are designing new food to hook you on it. How food marketers play with you by making the food they want you to eat look irresistible. How processed food is hurting your liver and adding fat to your abdomen. Keeping your blood sugar levels under control and preventing sugar imbalance in your body is an essential way to stop food cravings naturally. This is how you can practically achieve it. Quantity: What are healthy portion sizes for carbs? You should learn and stick to healthy portion sizes of any food, not only carbs, of course. But it is especially important for foods that contain a lot of sugar (remember, carbs are a complex form of sugar). You shouldn’t eat more than a healthy portion size for carbs, which is one cup. Frequency: How often should you eat? Don’t eat too often so you are not making your sugar and carbs metabolism work all the time. You should eat four times a day: breakfast, lunch, and dinner, and a morning or an afternoon snack, depending on when you need it. Ideally, these meals should be three to four hours apart. For example, if you have an early breakfast and a late lunch, you need a morning snack. Otherwise you’ll be too hungry at lunch and definitely overeat. Combination: How to combine your meals properly? Fiber, protein, and fat make sugar absorption slower and less efficient, therefore reducing the risk of food cravings. In fact, the right combination of meals will make them healthy yet filling, which will help you with two previous aspects: quantity (you will be able to stick to healthy portion sizes) and frequency (you will stay satiated longer). Have every single meal with the healthy portion size of protein and fat, and avoid having meals that consist only of sweets or carbs. Quantity: How to choose what to eat? Stick to foods with low glycemic load and glycemic index. Such foods will release glucose slower and help you manage your sugar levels properly so you don’t have food cravings. Maintain your healthy portion sizes for carbs, which is one cup. Have four meals a day making a break of three to four hours between them. Compose your meals properly and always have fat and protein with your carbs. Choose foods with low glycemic load and glycemic index values. Do you believe me when I say you can stop food craving naturally? Do you think it’s doable? What are your personal challenges when it comes to controlling your food cravings? I would love to hear from you! Arantxa is a trained biologist, nutrition specialist, and weight management coach. Born in Spain, she spent five years in Australia before moving to the US. Her motto is “Food is a pleasure. Nobody deserves to be on a diet.” Find out more about Arantxa and 32 Mondays and visit her on Facebook, Google+, Twitter, and Pinterest. 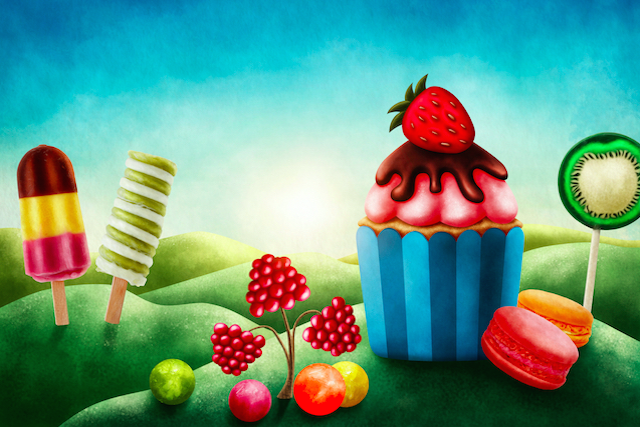 The post 3 Things That Cause Unhealthy Food Cravings and How to Stop Them appeared first on Tiny Buddha.